Bénéficiez d'une présentation complète de Ketchikan lors de cette excursion de 3 heures qui vous donne un aperçu d'un peu de tout : observation de la faune, découverte des parcs de Totem Bight et Potlatch, et visite de la ville de Ketchikan. Vous allez parcourir plus de 40 miles (64 km) au cours de votre visite touristique, apprendre l'histoire des sites durant le trajet et prendre des photos dignes d'une carte postale. Votre véhicule d'excursion peut être une navette, un bus ou un tramway. Transfert depuis le port disponible. Cette formule combinée de 3 heures propose une présentation parfaite de Ketchikan. Commencez par une visite de 20 à 25 minutes de la ville, et découvrez Indian Town, Harris Bridge, Creek Street, Salmon Ladder et bien plus encore. Rendez-vous sur une route pittoresque et passez 20 à 30 minutes à Herring Cove. En fonction de la période de l'année, vous apercevrez peut-être des ours, des baleines, des cerfs, des pygargues à tête blanche ainsi que des saumons (plus probable de juin à septembre). Voyagez en direction du nord de Ketchikan et apprenez à connaître Potlatch Park et le parc d'État de Totem Bight. Passez 45 à 50 minutes dans la région, en commençant par le Centre de sculpture des mâts totémiques. Vous entendrez des histoires de sculpture et vous en apprendrez plus sur les différentes techniques. Il y a plus de 30 mâts totémiques, des voitures anciennes et des armes. Embarquez pour une visite autoguidée ou achetez des en-cas dans le parc. Sur le trajet de retour, vous passerez devant l'usine de pâte à papier de Ketchikan, qui a dirigé l'exploitation forestière du sud-est jusqu'à la fermeture de ses portes en 1997. 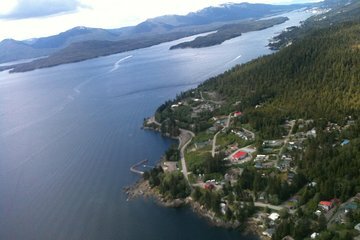 À la fin de l'excursion, votre guide vous fera des suggestions sur ce que vous pourrez explorer en plus à votre guise à Ketchikan. Remarque : l'itinéraire peut être modifié selon les conditions. Votre véhicule d'excursion peut être une navette, un bus ou un tramway. The day started slow with some interesting history of native life and totem poles. Our guide was fluid and knowledgeable and he kept us interested. Our excitement began when we witnessed the wildlife in action just on the side of the roads! Eagles, salmon and bears all together in the same place. I feel it was a bit on the pricey side for no more than we did. It also felt very hurried and rushed. This guide was very knowledgeable, a local native. He add the tour worth while. For a dreary drizzly day we had a great tour. Our driver/guide Debbie K. was so knowledgeable on everything from the city tour to Potlatch Park. We stopped to see a great many sites and she had a lot of history on all of them. Thanks Debbie for a wonderful day. This tour was great! The driver was very knowledgeable and informative. Would reccommend to anyone! Excellent.We saw great scenery, and a bear. Our guide, JJ, was great. Awful trolley tour. We had a first day on the job guide and an experienced guide accompanying her. The experienced guide did show us around the Totem pole park while the new one smoked by the trolley. We stopped in a parking lot to view a number of eagles perched near a stream and that was interesting. Suggestion: guides should memorize, practice and get tested on tour information then have a number of run-thrus on trolley to make sure customers will be satisfied. Spend your 80 elsewhere. This gets one star only because I couldn't submit the review without a star rating. It deserves 0 stars. I booked this tour because it was promoted by Viatour. You should seriously reconsider this decision. This was the WORST tour I've ever been on. To start, the driver, Cisco, was by his own admission sick as a dog and coughed and hacked the entire time we were with him. By reporting to work that day chose to expose the public to his illness. On the positive side he did seem to be the only person to have ever been on the our before and know what was going on. He also narrowly avoided what could have been a serious crash when a our bus pulled out across he road in from of him. I felt sorry for the tour guide, Richard. It seemed he had been thrown into this at the last minute even having to introduce himself to the driver. He had a good general knowledge of Ketchikan but not the tour itself. He had to refer to the driver several times as to the itinerary. Then there was our guide in training. She proudly claimed to have spent her entire life in Ketchikan and knew everything there was to know - if you wanted to know about where the Wal-Mart, grocery and local shopping mall were. She displayed very little actual historic or factual knowledge about her hometown and had no taking points or script provided by the company. When asked what was canned at the cannery she said 'fish'. When asked what kind of fish her response was salmon and other fish. She incorrectly identified the Coast Guard facility as the Navy base. She should have sat back and listened to the experienced guide and learned something. She also displayed a lack of professionalism when she sat in front of the shop at Totem Bight not only smoking but sharing a cigarette with Cisco. We should have been paid to take this tour. On a positive note, the group I was with has a great story to tell about the awful trolly trip in Ketchikan.